A person travelling to Sutton in 1800 from the Walsall direction would pass through the hamlet of Little Aston and then begin to ascend the long hill across the bleak waste of the Coldfield . Crossing Blake Street, the boundary of Sutton Coldfield, the track continued over part of the Coldfield called Four Oaks Common, eventually reaching habitations again at the hamlet of Four Oaks at the junction with Belwell Lane. Here the track widened out into a long village green, with houses and cottages scattered along its borders. On one side was the lodge of the Keeper of Sutton Park, guarding the Four Oaks Gate entrance to the Sutton Park. From the village the road bent slightly to the right to pass near Four Oaks Hall and join Lichfield Road at Doe Bank House. Thirty years later the route was very different. The commons had been enclosed, so the vast expanse of “furze and ling” of the Coldfield was now divided up into rectangular hedged fields, and the track shut in between hedges. The long climb over Four Oaks Common was still there, but the track had been made into Public Road No. XXIV: ”of the width of thirty feet commencing nearly opposite to the entrance gate at the north-ease end of Four Oaks Park and extending in a northwardly direction…over the middle of Four Oaks Common and terminating at the north side thereof at the road leading therefrom to Little Aston”. At Four Oaks, Streetly Lane and the top of Belwell Lane had received the same treatment, but forty feet wide. This narrow road passed through the middle of the old village green at Four Oaks, and the land on either side, formerly part of the green, was treated as part of the commons and allotted to private owners. Although there were seventeen houses on one side of the green, only four owners were allotted village green plots, Solomon Smith, James Earp, Sarah Hipwood and Mark Baker, this was because most of the inhabitants rented their houses from these four. The land was laid out as long front gardens to the existing houses - eventually new houses would be built on these plots close to the new road. On the other side of the green there had been a more drastic change just before the enclosure took place. In 1800 the road from Four Oaks to Doe Bank passed not far from Four Oaks Hall, and Sir Edmund Hartopp considered it a nuisance, the hoi polloi passing within sight of his windows with their noisy carts. He used his power and wealth the change the route of the road so that it was nearly a hundred yards further away from the hall. As this new road left the hamlet of Four Oaks it curved to the left instead of the right; Hartopp obtained a long thin triangle of land which was the course of the old road, and set up a lodge and gate there at the entrance to his Four Oaks Park. The altered course of Four Oaks Road joined Lichfield Road at the present traffic island; the old road junction had been nearer to Sutton, where Lichfield Road begins to curve. Thus the whole of this route had been transformed in the space of thirty years. 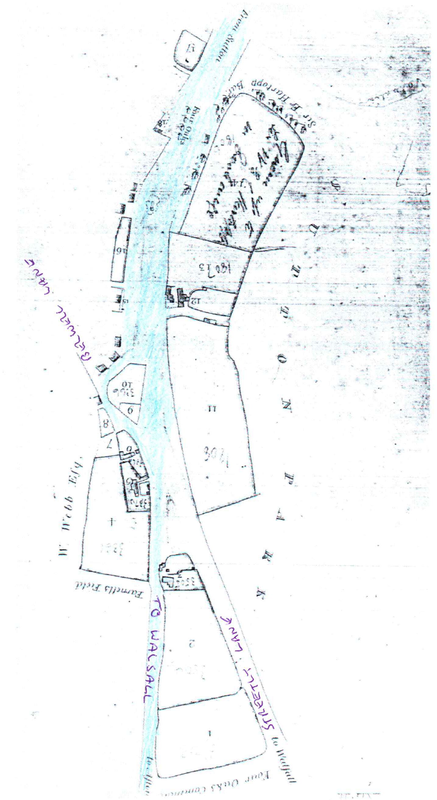 The plan of Four Oaks on the left is from the Corporation Survey of 1811, the route described is shaded blue. 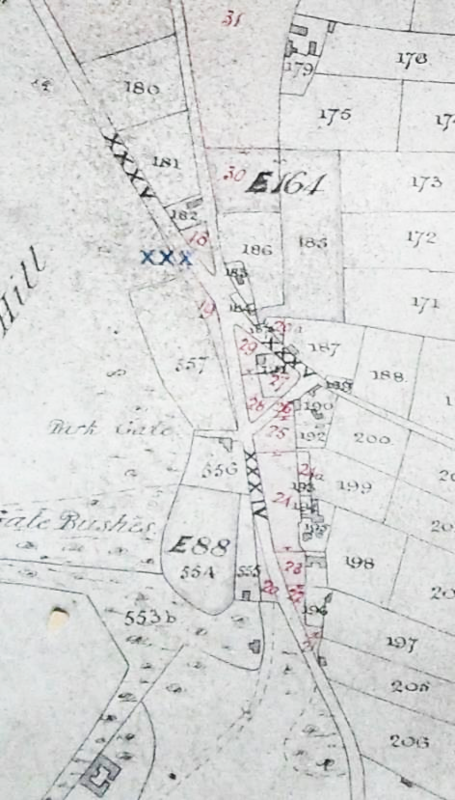 On the right is a detail from the Enclosure Award Map of 1850, the plots on the former village green are numbered in red ink.